What could be better than Grandma Love? How about a little Great-Grandma love? 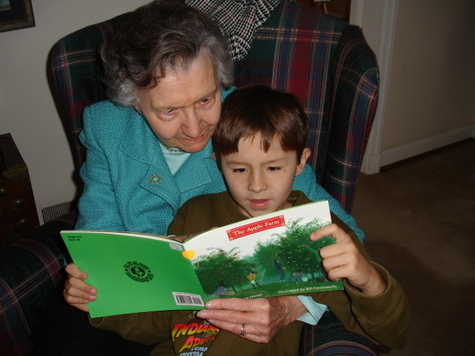 I love this picture of Alex and his Great-Grandma Lois because they are sharing a book. Alex is reading "The Apple Farm" to her, and she is listening very intently. It was a wonderful little moment between the two of them. We are so fortunate to have someone as special as she is in our lives. Happy Love Thursday! Many of you know that Karen of Chookooloonks has decided to shut down her blog. Karen was the founder of Love Thursday, along with Irene of Momster. I look forward to all the entries on Thursdays, and have found some blogs I might not have otherwise been introduced to. For that, I am forever grateful to Karen. She has inspired many people with her artistry as a photographer, her beautiful, thoughtful writing, and her commitment to spreading light, love, and kindness through blogging. As I told her, I feel like one of my friends just announced that she is moving...to Mars. 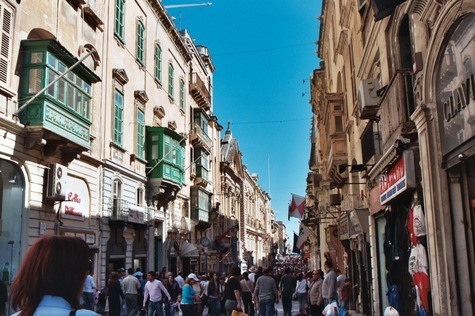 I hope that the Love Thursday tradition continues, and that Karen will continue writing elsewhere in the blogosphere. Hers is a voice worth listening to. I don't usually do memes, mainly because they take too long, but this one was fun. I found it at How to Be a Bongga Mom, the new site of my Silicon Valley Moms Blog compatriot of the same name. If you are reading this, consider yourself tagged and leave a comment on where I can find your answers! I wrote earlier this week about Pauline the Magnificent, my wonderful "other mother" who has become another grandma to Alex. 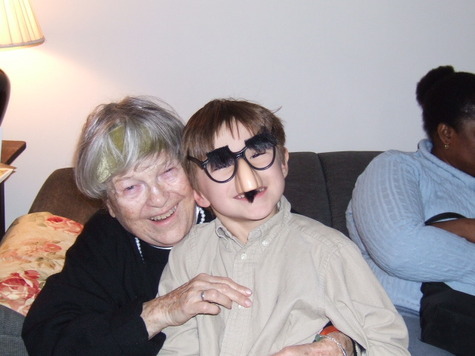 Last weekend at her 80th birthday party, she supplied the kids with Groucho glasses and they all had fun with being silly with the glasses. I'm sure none of the kids had any idea who Groucho was, but they thought the glasses were cool. Later on, Pauline's nephew, singer-songwriter Charles Lyonhart, gave a little house concert and sang for us. Alex and the other kids had a great time dancing to the music. Alex has been taking hip-hop dance classes through his afterschool daycare program, and was excited to show off his moves. I love this picture of Pauline and Alex because it shows their silly side. Later on, Pauline donned the glasses and had all four of her kids and her daughter-in-law put them on for a family portrait. Pauline has always been such a fun-loving person, with a quirky sensibility. I'm so happy that she and Alex have bonded. He has already asked when he can go back and visit her again. I hope it will be soon. Happy Love Thursday to everyone! This posting is dedicated to all those women who step in to parent us (or grandparent us) when we need an older, wiser perspective, someone to lean on during hard times, and someone to share the silly side of life with as well. Let the Pauline in your life know how much you appreciate her today! 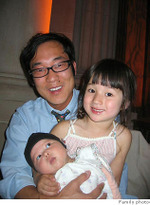 UPDATE: Sadly, CNN.com is reporting that James Kim was found deceased earlier today. My sympathies, thoughts, and prayers go out to his friends, family, and loved ones. I hope that everyone will keep them in their hearts during this difficult time. I woke up at 4:30 am this morning, probably due to some post-trip jetlag, but the first thing I thought was, "I wonder if they found James Kim yet?" Since we got back, I've been following the story of the Kim family of San Francisco, who were returning home from Thanksgiving visits with family in Oregon when their car was snowbound. Rescuers found Kati Kim and their two young daughters on Monday after nine days, but James has not yet been found. I'm not sure what it is about this story that is so compelling to me. I never me the Kims, but I've met hundreds of families like them over the last five years. They could be the family down the street, in our pre-school, in our parents club, in our babysitting co-op, colleagues from work, or just people that you meet any day of the week in Silicon Valley and San Francisco. My thoughts, good wishes, and prayers have been with them since I heard about this via Kimchi Mamas. Citymama, uniter of bloggers, has started a little movement, a chant, a cry out into the blogosphere, to bring James home. "Let's go, James!" is a way to say that we are not giving up hope. More information can be found at SF Gate and CNET. I'm keeping up the hope that James will be found alive and reunited with his family soon. We traveled to New York City this past weekend, the Bronx to be exact, to celebrate the 80th birthday of my friend, Pauline. There are not many occasions that would prompt the three of us to hop on a long flight, endure weather delays at Dulles, and one long sleepless flight back, but celebrating someone as dear to me as Pauline was worth it all. I would go to the ends of the earth for Pauline, because I know she would do it for me. I met Pauline in 1983, when I was a freshly-minted Barnard grad with no earthly idea what I was going to do with my life. I got a job as a paralegal at the Legal Action Center a non-profit civil rights law firm. Pauline was the office manager, and office "mom." She became like my second mother, because as she put it, "Everyone needs a little Jewish mother in their lives." That year shaped the direction of my life in more ways than I could express, and always there at the center, as a gently guiding and loving force, was Pauline. She was interested in me and what I had to say, a patient listener, trusted confidante, and loyal friend. I could tell her the things that would horrify or worry my own mother to the point of derision. Pauline would nod, and let out a sympathetic little moan, and reassure me that I was a grown-up now and could make my own decisions. People in the office looked to her for advice and support, especially those of us without families nearby. We became an extension of her family, and many of the people she nurtured over the years were at the party on Saturday. There were family members, neighbors, and other coworkers, like me, who became a part of Pauline's extended family through the years, drawn in by her warmth, her sense of humor, and her kindness. Pauline is the mother of four grown children, and her three daughters became my sisters, or sistuhs as they say in the Bronx. I never met Pauline's son until this party, because he lived abroad during most of the years I have known her. Their family was as much a part of my identity as my own flesh and blood relatives, and I love Pauline and her girls just as much. Though we don't see each other or talk often, I know that I could call anyone of them anytime of the day or night and it would be as though no time had passed. I know that we could talk for hours and share the same silly references and jokes that we've shared for more than 20 years. I've been fortunate to have many wonderful friends in my life, but a few I consider to be sisters born of my heart, like these women. My fondest hope is that Alex will have such friends some day. Years ago, Pauline took a trip to Europe and she sent me a postcard from a castle in Germany. She was having a fabulous time, she said, and was drinking in the sights and sounds and all that Europe had to offer. She was roaming through castles and museums, having fun visiting her grandkids, and just enjoying life. She signed the card, "Pauline the Magnificent." 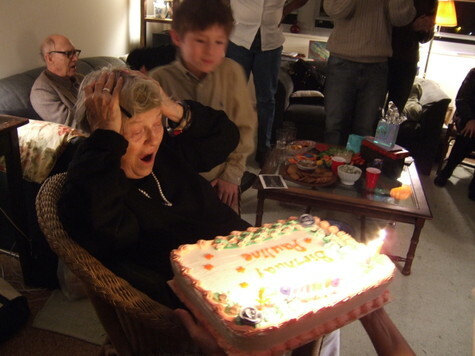 Happy Birthday, Pauline. You truly are Magnificent...then and now. 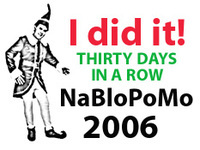 Not only did I finish NaBloPoMo, I actually won one of the prizes! I'm stunned, I tell you, stunned. I haven't actually won anything in about twenty-five years. That prize was a used car I won in a bingo raffle at the Moose Lodge, which I promptly sold in order to pay for a semester of college. I didn't need a car, but I needed to figure out a way to pay for school. I thought I'd pretty much worn out my prize-winning karma for a lifetime on that one. I won a year of Flickr Pro from Heather Champ, something I can really use! I just started posting to Flickr a few months ago, and have enjoyed finding out about what the site has to offer. Heather is co-founder of JPG magazine, which I just discovered is a photo-sharing site built around a fantastic photography magazine. Thank you so much to Heather and Eden Kennedy of Fussy! I am just thrilled with the prize. The realization that I was not cut out to blog every day and a newfound respect for those who do this for a living. I plan to click through at every opportunity on those blogs. Seriously. A week of tributes to my wonderful father-in-law, who passed away the first week of November. Some great new blogs added to my Bloglines from the NaBloPoMoRando. Figuring out how to post YouTube video to my blog, thanks to Thida. Some sage advice from Frank Paynter that every blog post doesn't have to be perfect, just done. The impetus to join the BlogHer Ad Network, since my page views more than doubled in November. I plan to give all proceeds to charity, but I haven't decided which one yet, since there are so many worthy causes to support. Realizing that I have some pretty good photos in my iPhoto that I probably wouldn't have shared without a reason. About 75 very kind, witty, thoughtful, encouraging comments, as many as I'd gotten in the entire year before NaBlo. Finishing up my mini-series on our trip to Prince Edward Island...almost. Looking forward to Love Thursday even more than usual! So thanks again to the fabulous Fussy for coming up with this idea. I am looking forward to next year already.